Small volumes of anti-DSP antibody vial(s) may occasionally become entrapped in the seal of the product vial during shipment and storage. If necessary, briefly centrifuge the vial on a tabletop centrifuge to dislodge any liquid in the container`s cap. Certain products may require to ship with dry ice and additional dry ice fee may apply. Western blot analysis of extracts of various cell lines, using DSP antibody at 1:1000 dilution. 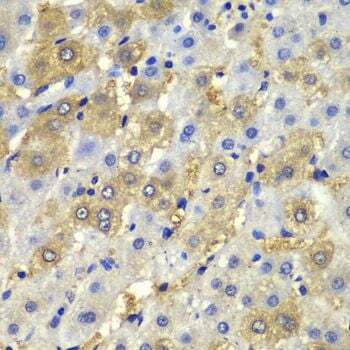 Immunohistochemistry of paraffin-embedded human liver injury using DSP antibody at dilution of 1:100 (40x lens). NCBI/Uniprot data below describe general gene information for DSP. It may not necessarily be applicable to this product. 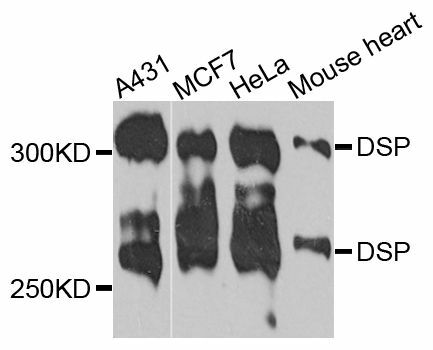 Desmoplakin: Major high molecular weight protein of desmosomes. Involved in the organization of the desmosomal cadherin- plakoglobin complexes into discrete plasma membrane domains and in the anchoring of intermediate filaments to the desmosomes. Homodimer. Interacts with COL17A1 (via cytoplasmic region). Associates (via C-terminal) with KRT5-KRT14 (via rod region), KRT8-KRT18 and VIM intermediate filaments. Interacts with DSC2. Isoform DPI is apparently an obligate constituent of all desmosomes. Isoform DPII resides predominantly in tissues and cells of stratified origin. Belongs to the plakin or cytolinker family. 2 isoforms of the human protein are produced by alternative splicing. 1. Case Report: PKP2/DSP mutations in patient with Brugada syndrome and ventricular tachycardia.